A tiny house from Big Freedom Tiny Homes can be made to match your existing home or in this case a barn. This 26-foot tiny house design with a 2-foot loft extension matches the barn on this property perfectly. The exterior was painted deep red with some grey accents and white trim to match the barn it's parked in front of. You can see the little extension in the loft space as well which makes room for more storage space in the home for clothing and other items. There is also a nice small storage box outside of the tiny house as well which would be great for storing mechanical items and outdoor gear. Inside, this design is beautiful, the kitchen backsplash is especially inspirational, made all out of river rock, and it pairs nicely with the granite countertops. They installed an apartment sized gas range and oven as well as an apartment sized fridge which is perfect for those who love to cook in their tiny house on wheels. The cabinets in the kitchen offer plenty of storage, and there are also some shelves in the corner as well as some hooks to hang items from. There's also a shelf that extends from the main sleeping loft over top of the kitchen window that would be great for plants or other items. The bathroom is just beyond the kitchen with a sliding door for privacy. This bathroom features a flush toilet and sink with a shower stall. With Big Freedom Tiny Homes, bathtubs are also available in these designs. The living room includes a great convertible sofa from Ikea that is very popular in tiny houses on wheels. It's honestly the best sectional sofa for a tiny house because of the storage space it has, and the fact that it converts into a bed is also awesome. That way if there are ever guests sleeping over they have a place to sleep that is really comfortable. There is also a second loft in this tiny house that features a ladder to get up to it. This and other tiny house designs are available through Big Freedom Tiny Homes in Bellingham, Washington. 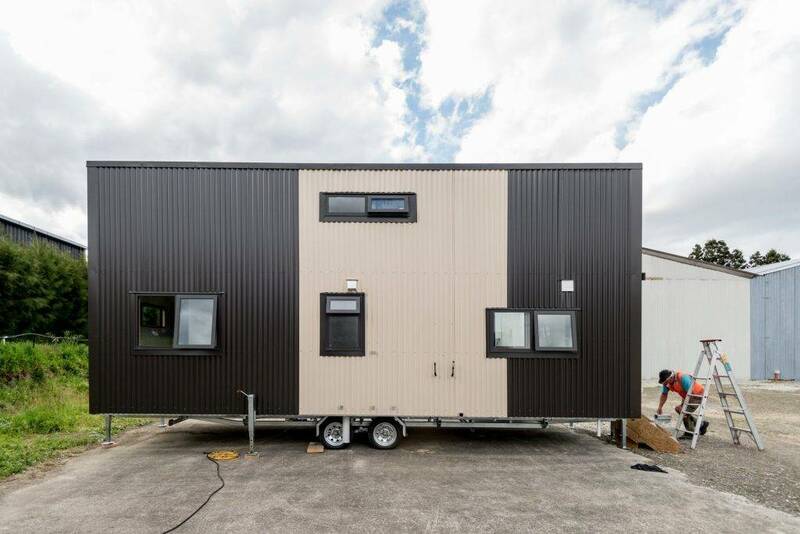 The Kauri is a tiny house with a great minimalist style and a fabulous layout, it's actually quite different from any other tiny house designs we've seen. The floor plan also seems to be a bit wider than most tiny houses on wheels too which is nice because there is quite a bit more space to spread out. The design is from Tiny House Builders in New Zealand, and the company has a few other innovative tiny house designs to choose from. The expansive layout is very functional with a lot of great storage space and a focus on bedroom space. In total, this tiny house has 3 bedroom areas and 1 bathroom so it can sleep up to 6 people. The tiny house definitely feels more like a conventional home rather than an RV, with painted walls instead of the plastic finishes. There are also regular luxury items like a stainless steel oven and an all in one washer and dryer unit. There is even a dishwasher to keep things really convenient. The kitchen is very sleek and modern with white cabinets and white quartz countertops. There is also a flushing toilet, a full sized 900mm corner shower and a sink with a vanity. Two of the bedrooms are in loft spaces above and can be accessed by a staircase. They're partially private with doors, but there are spaces between the wall and the ceiling to provide some air circulation. The living room shares space with the kitchen, and there could be a couch or a desk placed in this area depending on the needs of the customers. Since this tiny house is a bit larger than most, it's meant to stay in one place and not to be moved around too much. Smaller designs are best suited to be moved around more often. Having a deck built onto the home would also be a great way to extend the living space of this home, and there is a nice sliding door that would accommodate that. This is a wonderful design with so many great innovative ideas, it's very practical, but it's also got a nice, luxury feel to it as well. The Pohutukawa is a tiny house that is still in the design phase. The rendering of the home shows what it will look like when it's built and decorated with furniture inside of it. Choosing the design for your tiny house is an essential step on the journey to building a home that will suit your needs and style. So this is a great place to start. This tiny house design from Tiny House Builders in New Zealand has a very simple design on the outside done in a darker colour of siding and a board and batten style. They also included double doors with glass in them to offer more views from the inside of the house as well as light. They went with a shed style roof with a slow slope which gives the home some more valuable head space inside, especially in the lofts. You can also see that they didn't include a ton of windows on the back side of the tiny house which will leave some wall space to hang art or even a TV. Inside, the rendering shows how spacious the home will be once it's built. There is enough room for a sectional sofa, a small table and chairs as well as the kitchen. The kitchen will even have full sized appliances as well which is always nice to see in a small space. The stairs that lead up to the loft space above the kitchen create storage for the main area of the home as well. Then, the bedroom loft is also quite private from the rest of the house and also has nice windows in it too. On the other side of the tiny house design is the bathroom and there is another loft above that. The additional loft is accessed by a ladder and could be used either for storage or for another sleeping space. The tiny house designs from Tiny House Builder seem to be a bit wider than the average tiny house on wheels because they always seem to be able to fit more items in it. The larger designs are best for parking permanently though as they can be tougher to move around than the smaller design options out there. A beautiful, clean design is what the Loft Edition tiny house is all about. This is one of the beautiful tiny houses on wheels from Mint Tiny Homes based in Vancouver, British Columbia. They keep their designs nice and simple, and they always offer great storage in their homes. The exterior of the Loft Edition tiny house can be done in a variety of ways, but here is a look with it all done in plain, stained wood and wood trim. The Loft Edition designs can range from 24 feet long to 34 feet long starting at $63,800 CAD going up to $73,800 CAD. The interior of the tiny house features wood tongue and groove panelling which has been painted all white for a bright and airy look. The ceilings are also done in tongue and groove panelling, but they simply left the wood it's natural colour. The main entrance door goes into the kitchen where there is plenty of great counter space made from wooden butcher block. The cabinets are all white to match the walls, and they also added in a great gas range and oven. There is room for a large fridge next to the door, but they put in a mini fridge in this model. Storage could then be placed above the fridge as well. Above the kitchen is a loft area which could be the main sleeping area. It's a nice, large area that could accommodate a queen sized bed and even some storage. The loft on the other end of the home is a bit smaller and could also be used as a sleeping area, but it would also work great as a storage space as well. Both of the lofts have ladder access, but a set of storage stairs may also be able to be worked into the design. Under the second loft on the other end of the home is the bathroom and a little room. The room could be used as another small bedroom or as an office space, and the living room could be in the space between the kitchen and the room. If the wall were left out, the space would make a great living room area that could house a sofa. 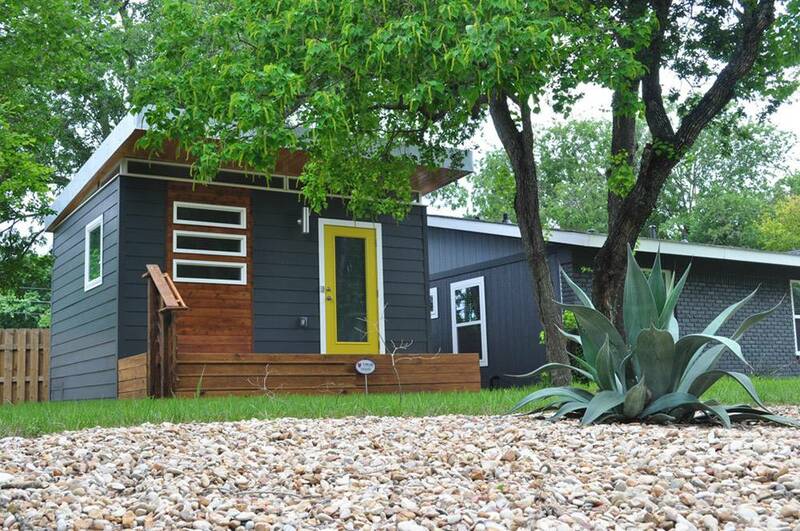 Each of the designs from Mint Tiny Homes can also be customized to suit the customer's needs. 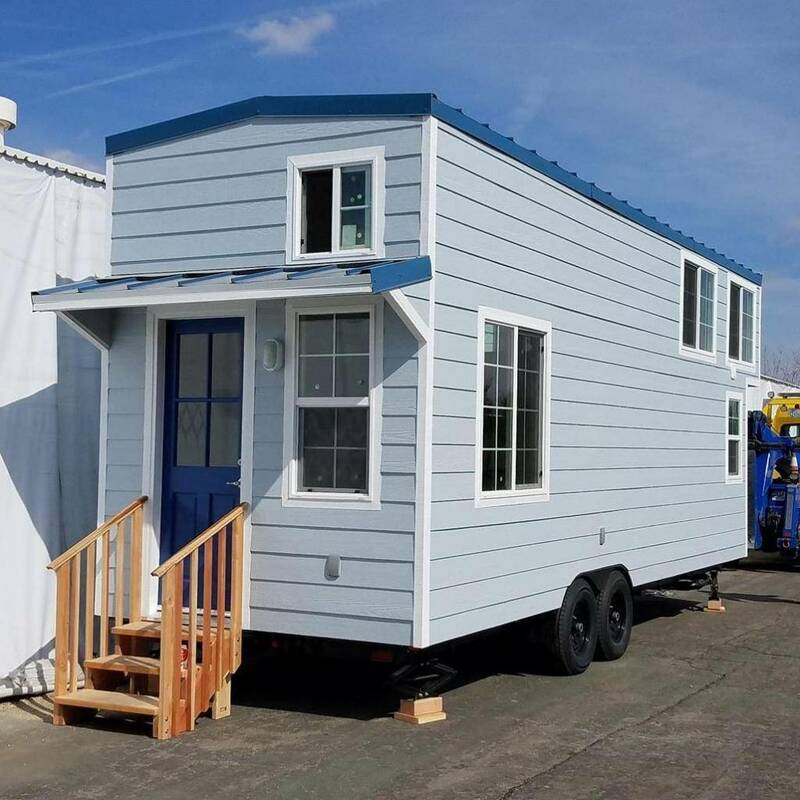 With a smart design and plenty of great features, the Napa Edition tiny house design from Mint Tiny Homes is a must see tiny house on wheels. Mint Tiny Homes is a company based in Vancouver, British Columbia and they create some very innovative designs. They focus on open concept spaces and implementing great storage solutions to make these tiny houses work for their customers. 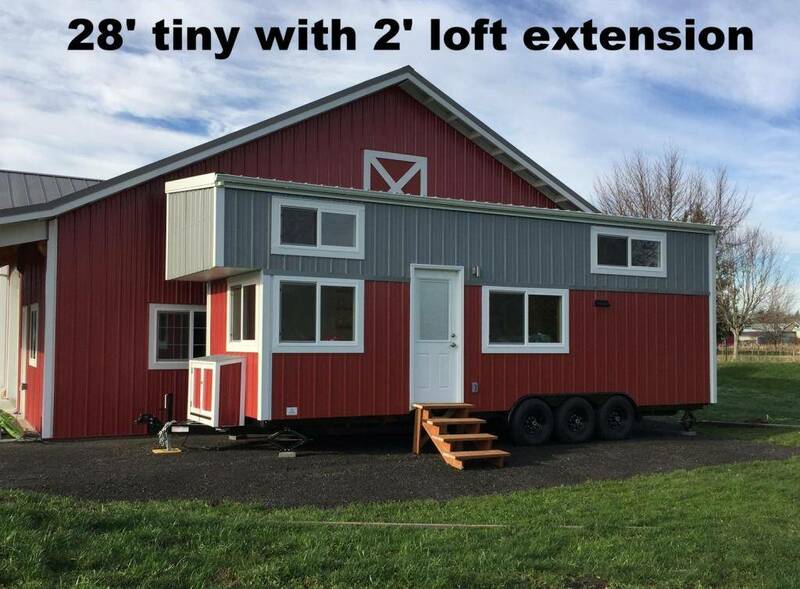 The Napa Edition tiny house starts out at 24 feet long up to 26 feet long. So this design is the one that's perfect for travelling around or moving around often. It's lightweight and very easy to tow with an appropriate vehicle so it could be an excellent travel trailer or cabin on the go. Inside, there are many great features including the kitchen which has an L-shaped countertop and lots of storage underneath. More storage could also be added on top if need be. Either in the form of more cabinets or some shelving. The sink is a large, deep ceramic sink with a gooseneck faucet and there is also a built-in gas range for cooking. There could be room for a mini fridge below the counter, but an apartment sized fridge might even be able to squeeze in beside the countertop into the living room area. The living room is where the entrance is, so building a beautiful deck off of the double doors would be a good idea. Then they could be opened up to extend the living space to the outdoors. Behind the kitchen is the bathroom which has a full sized 30 inch by 30-inch shower unit and a high-quality shower faucet. There's also an electric bathroom ventilation fan and an opening window with frosted glass for privacy. A composting toilet is included in this model, but it could also be a flush toilet instead. There's a great pantry in the kitchen beside the bathroom door with shelving to store canned goods and other items. On the other side, there's a closet where clothes or coats can hang, and there are also hookups for a washer and dryer combo unit. Above the kitchen and bathroom area is the sleeping loft which has ladder access. The loft is large enough to fit a double or queen bed, and they added three windows for light and ventilation. What a beautiful and practical design that would function very well. 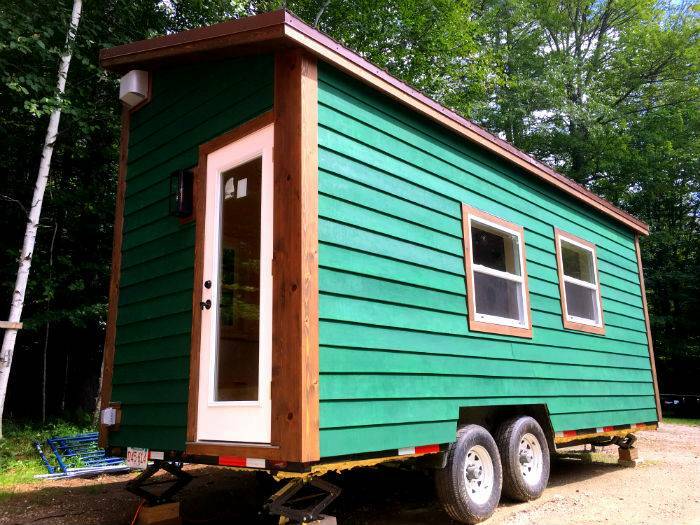 The Emerald is undoubtedly a gem of a tiny house built by Tiny Heirloom who build homes for the show Tiny Luxury. The company created a tiny house on wheels that measures 24 feet long and contains so many great features. Through the emerald coloured door is the kitchen area with beautiful granite countertops and white cabinets. Also included is a large sink, a range and oven as well as a stainless steel refrigerator. Instead of doing more cabinetry on the upper area, they opted for some open shelving which helps maintain a spacious feel. Next to the kitchen is a dining table in front of the window which is great for eating meals or enjoying a cup of coffee. The living room area is charming with two matching chairs and a small table, but a small sofa could also fit nicely in that corner as well. There's also an all in one washer and dryer combo unit on the main floor which is essential for doing the laundry at home. There is also lots of extra space within the closet that the washing machine is in and shelves could be installed to make the most of the space. There are a total of three skylights throughout the home as well as all of the windows in the home which together bring in some great natural light. The skylights even open to bring in some fresh air in the loft space. The bedroom loft is pretty cozy, but there is enough room for a queen mattress. On the other side of the house, there is another loft that would be best used for storage space. In the bathroom, there is a shower and a composting toilet as well as a sink and vanity. In a corner by the closet in the living room, there is also some space for a small desk which would be perfect for working from home or doing some drawing. This great design is one of the many beautiful tiny houses from Tiny Heirloom who creates custom tiny houses for people who want to give small house living a try. An impressive tiny house on wheels, The Goose tiny house by Tiny Heirloom shows how spacious a larger floor plan in a tiny house can be. But why is it called The Goose? It's because of the gooseneck trailer that it's built on which provides it with some extra space inside. From the outside, the home looks larger than many tiny houses on wheels, and it almost looks like a park model. You can see in the rendering that adding a deck onto the home will also help to add more livable space to the already spacious floor plan. Entering into the home, the ceilings draw the eye upward, and the impressive wooden beams make a statement, adding to the rustic modern style of the home. The skylights in the ceiling also draw attention upward which leaves the illusion of more space. The stunning kitchen is the first thing that is seen upon entering the home. The wood cabinets and dark countertops are perfect for the minimalist modern decor, and the stainless steel appliances are perfect as well. While this is only a rendering, it shows us some fantastic design concepts for tiny houses on wheels showing us what is possible. On the other side of the kitchen is a shelving unit built into the kitchen cabinetry that could act as a bookshelf or a storage shelf for anything else. The living room is also on the other side of the kitchen, and they show how nicely a larger comfortable sofa would fit in there. There's also a flip up table across from the kitchen that would be perfect for meals. The master bedroom is located at the front where the gooseneck part of the trailer is, and it's past the bathroom too which provides the space with privacy. There is the option to create a closet space above the bathroom as well as to create a second loft over the living room. Leaving these spaces open will just make the entire space feel larger though. This design starts at $84,995 with options of a 31 foot, 34 foot or 37-foot long trailer. The Craftsman tiny house on wheels is for people who like nostalgia. This tiny house design is beautifully crafted inside and out and has an ageless quality that brings you back to the days when building was an art. The Craftsman tiny house design is lightweight, RVIA certified, and expandable and makes you feel at home wherever you are. You will love the Craftsman tiny house design from the moment you see it. With its bright blue exterior, peaked roof and covered front porch, you can't help but want to take a look inside. And the interior doesn't disappoint, with an upstairs loft with skylight and windows, white walls with wood trim and beams, and a charming kitchen with stainless steel appliances there is so much to love. The Craftsman also has a tiny upper loft for storage, shelving, and a living area, making it a great space for all of your small house living needs. The Craftsman is just one of the tiny house designs available from Tiny Heirloom. These tiny house builders are a family run business based in Portland, Oregon. They have a variety of tiny house designs to choose from in their Signature Series, they can design Custom tiny homes, and they have DIY Shells available for people who want to help design a tiny house design themselves. 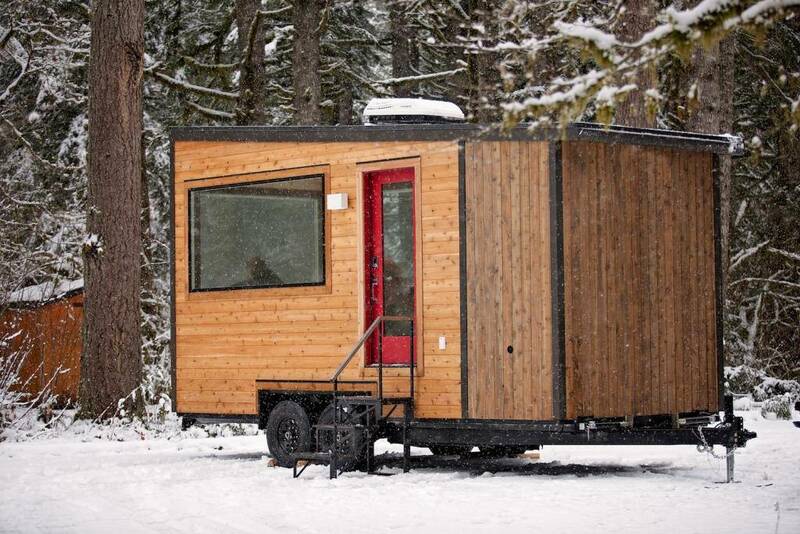 The Vantage tiny house on wheels is made for the explorer. This tiny house design has several large windows to enjoy the view wherever you go. The tiny house on wheels is a lightweight structure and has an aerodynamic architectural design that makes it the perfect option for use as a weekend getaway or the long-term traveler. From the outside, this tiny house design uses plenty of wood with dark trim and a bright red door that gives it a unique look. Once inside the wood theme carries through with wooden walls, ceilings and floors. The kitchen cabinets are a darker wood with a wooden countertop for a look you will be sure to love. The Vantage has a nice feel as soon as you walk in with two steps down into the tiny house space. There is a built-in bed in the living space which makes for a cozy place to sleep or sit any time of day. 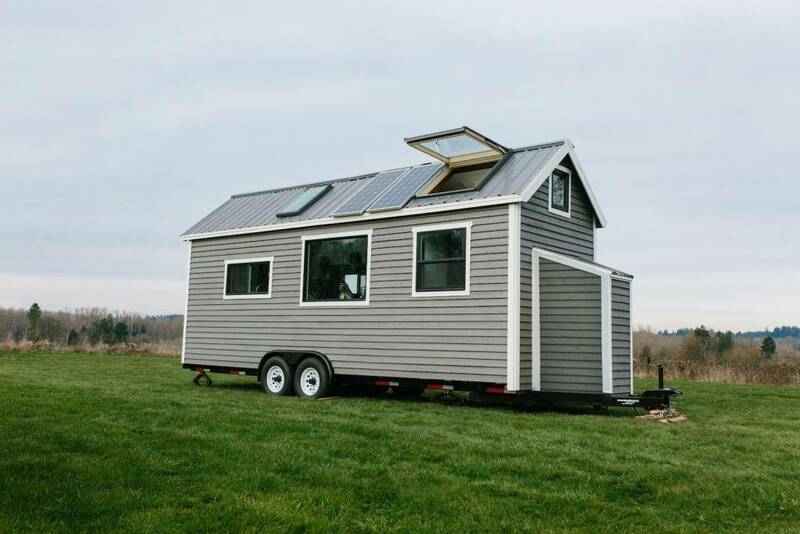 The Vantage is just one of the tiny house designs available from Tiny Heirloom. These tiny house builders are a family run business based in Portland, Oregon. They have a variety of tiny house designs to choose to include their Signature Series, Custom tiny homes, and DIY Shells available for people who want to help design a tiny house design themselves. The Carmel Model tiny house on wheels has 230 square feet of space with two bedrooms and one bathroom. The Carmel is inspired by the city by the sea with the same name and has a light blue exterior with blue trim and door. Once inside this tiny house design doesn't disappoint with white walls, wooden floors and ceiling. The living room area of the Carmel has lots of light and a cozy fireplace. There is an upstairs sleeping loft with stair access. There is also a large bathroom vanity with a granite counter top. 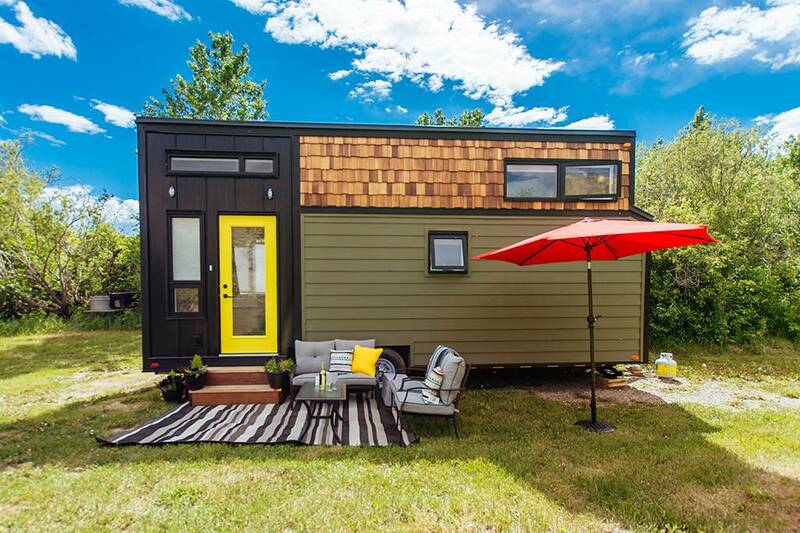 The Caramel tiny house on wheels is just one of the tiny house designs you might choose from Seabreeze Tiny Homes. They provide several standard features, to include towing capability, LED lighting, and insulation. When it comes to your tiny house design many of the details will be up to you, including the bathroom decor options, the appliances, and off-grid connection options. There are several custom features you can also choose to include a washer and dryer, outside electrical receptacles, solar panel wiring, television and cable hookups, and smart home technology to name a few. The Carmel Model is a tiny house on wheels from Seabreeze Tiny Homes. They design and build their tiny homes in Fresno, California, and work with clients throughout the country. The Nova is an 8x26 foot tiny house shell that has an innovative split-level sleeping loft instead of a traditional loft. This means no more having to crouch when you go to upstairs to sleep. The Nova split-level loft features enough space for a queen-sized bed and frame, along with enough space to sit and stand without having to bend. The Nova tiny house design was fully insulated with most of the wall material up and finished on the exterior. The Nova Shell in the photos was moved to Western Vermont to be finished by the owner. The 8x26 foot Nova Shell is a good way to save money and get the tiny house design that you want and need. Typically it takes Tiny House Crafters 9 weeks to build a move-in ready tiny house design but will vary depending on the tiny house design. For custom tiny house designs, Tiny House Crafters will work closely with the buyer to help design their dream tiny house design, and the building doesn't start until the last decision is made and the building plans are set. 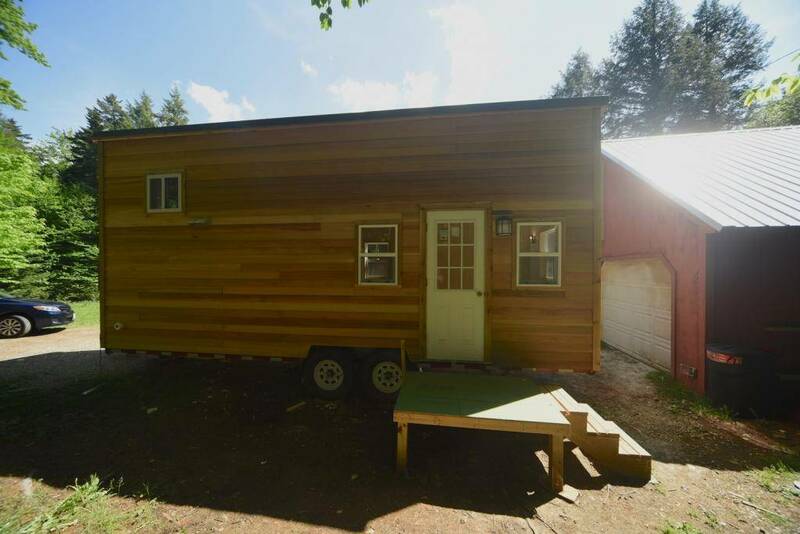 The 8x26 foot Nova tiny house shell is available from Tiny House Crafters, LLC located in Londonderry, Vermont. 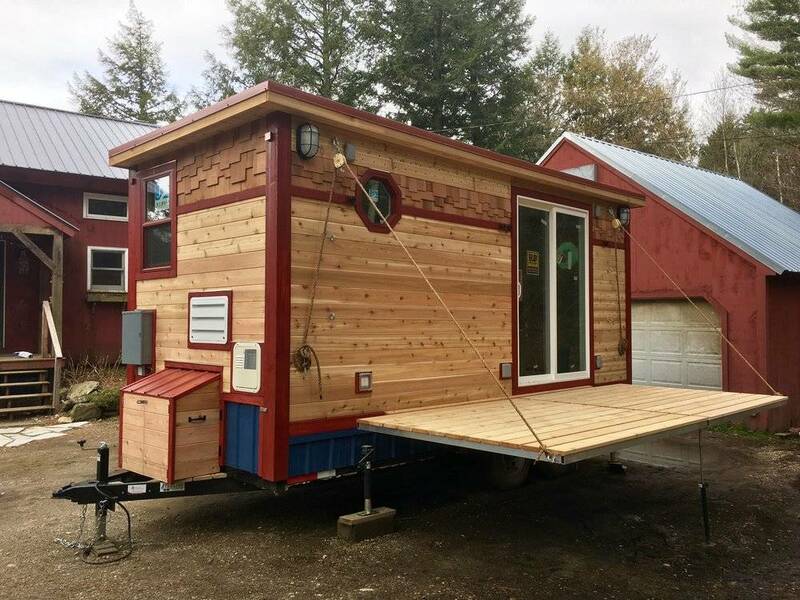 The 8x24 foot Rodrigue tiny house on wheels is a beautifully crafted custom tiny house design that features a custom kitchen with electric fridge, compact propane cooktop, and a reclaimed wooden dining room table. 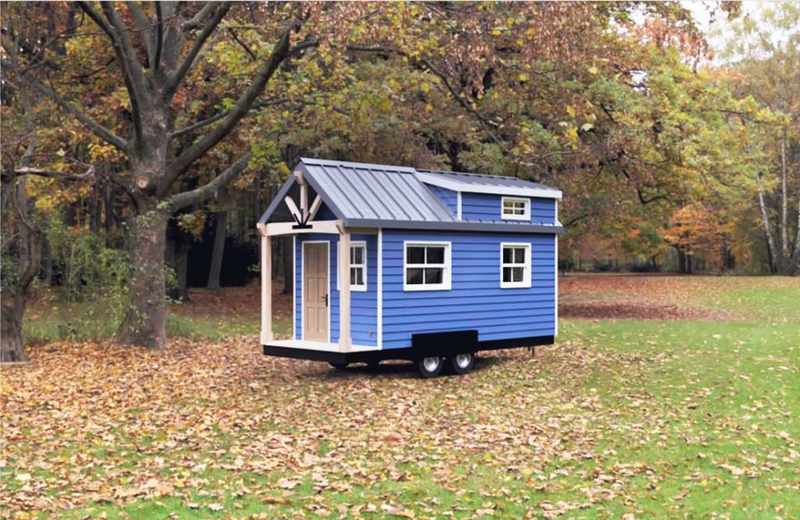 The Rodrigue tiny house design has Nature’s Head composting toilet and a Takagi water heater. This tiny house design is heated with a wall-mounted Williams propane eco-heater and has an under-stair cubby storage area, and walls finished with 1/4 inch plywood and wainscoting for a traditional, drywall sort of look. From the moment that you set eyes on the Rodrigue tiny house design, you will like what you see, with a natural wooden exterior. Inside there is plenty of wood used from the floors, ceiling, stairs with storage, and kitchen countertop which combines nicely with the white walls and white kitchen cabinets. The upstairs sleeping loft has a couple of small windows to let in the natural light. 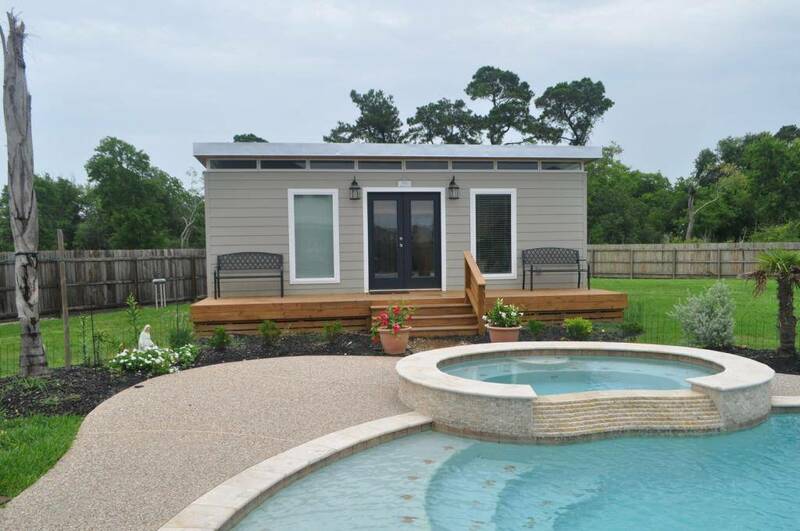 The Rodrigue tiny house design is perfect for all of your small house living needs. 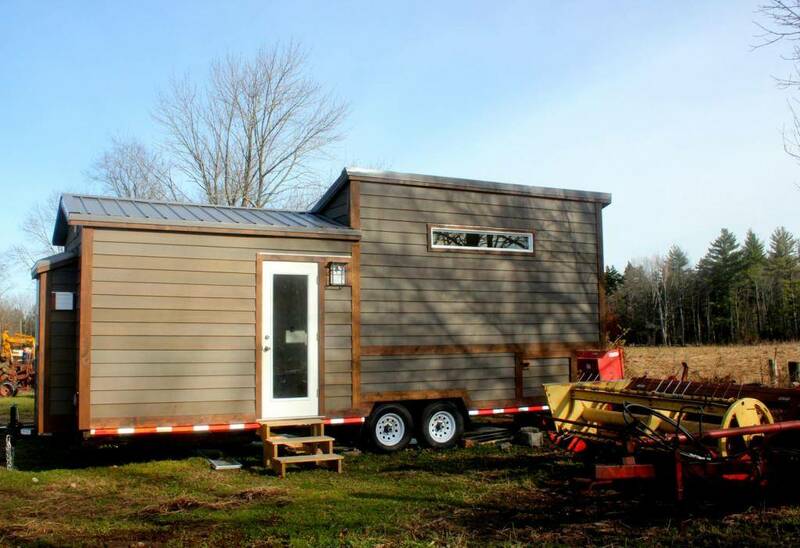 The Rodrigue tiny house on wheels is available from Tiny House Crafters, LLC, a family-run business located in Southern Vermont. These tiny house builders and consultation firm serve the New England area and beyond. The Evergreen tiny house on wheels is a custom build that includes a built-in, expanding bench seat that hides an off-grid water system, and a propane/electric 7.2 cubic foot fridge with a custom cabinet. The bathroom has a fiberglass shower stall, and Nature’s Head Composting Toilet. There is an upstairs loft with a four by two foot skylight, with access by a handmade wooden ladder. This custom tiny house design has an exterior with evergreen stained cedar clapboards, and a brown corrugated metal roof. The Evergreen tiny house on wheels has an interior that uses light wood throughout to include the walls, floor, ceiling, kitchen cabinets and kitchen countertop. It typically takes Tiny House Crafters about nine weeks to build a move-in ready tiny house design; this time can vary depending on the tiny house design. For custom tiny house designs, they work closely with the buyer to design their dream tiny home and start building when the last decision has been made, and the building plans are set. The Evergreen tiny house on wheels was designed and built by Tiny House Crafters, LLC. These family-run tiny house builders are located in Southern Vermont, serve the New England area and beyond. The Whirly House is a beautifully crafted tiny house on wheels that features an optional off-grid water system, drop-down stage, and custom finishing. The Whirley House has 144 square feet of space with a fully functional kitchen with butcher block countertops, a space-saving kitchen sink, two-burner propane cooktop, and a propane/electric mini fridge. The tiny house design has a convertible bed on wheels that functions as a couch when tucked away and a bed when pulled out. You'll love the corrugated metal wet bath that has a removable cedar floor that reveals a shower pan below. The bathroom has a compostable toilet. The Whirly House has a drop down stage/patio, perfect for sitting back and enjoying the view or playing music with your friends. The exterior of this tiny house design combines three different kinds of siding to include blue corrugated metal, cedar tongue and groove boarding boards, and cedar shakes. And if that weren't enough, there is a custom guitar on the side that can be played. The 8x18 Whirly House is a tiny house design from Tiny House Crafters, LLC. This family-run tiny house design company is located in southern Vermont, and serves the New England area and beyond. Take a look inside The Summers Night Dream, a tiny house on wheels that is true to its name. The Summers Night Dream has a master bedroom on the main floor with an upstairs loft for the kids. There is enough space in this tiny house design for everyone to get a cozy sleep. This tiny house design has a white exterior with an olive green door. Inside the tiny house design feels spacious and light with white used on the walls, ceiling and kitchen cabinets. There are light wooden floors, wooden beams and a black accent wall for the perfect combination. You will love the modern bathroom with shower, sink and toilet, separated from the rest of the tiny home with a pocket door. Access to the upstairs loft is by ladder. The living area feels spacious, and there is a countertop that can be used for eating or as a work surface. The master bedroom is a good size and has windows at both the head and the foot of the bed for plenty of natural light. This tiny house design has all sorts of storage from shelves, storage under the step up to the master bedroom and lots of kitchen cabinets. This tiny house on wheels is available from Teacup Tiny Homes in Alberta, Canada. The Summers Night Dream is just one of the tiny house designs they have available. The Not So Lonely Wanderer is a tiny house on wheels that you will be sure to love. Beautifully crafted with plenty of features, this tiny house design is perfect for all your small house living needs. From the outside, there is a fun mix of colors with a bright yellow door, natural cedar shingles, black siding and olive green. Once inside there is wood floors, stairs and ceiling combined with white walls. The kitchen cabinets are a lovely shade of blue with a live edge wood countertop, white countertops and modern kitchen appliances. The tiny house on wheels even has a washing machine tucked nicely out of the way beside the kitchen cabinets. The bathroom is a good size with a modern sink, shower and toilet. There is an upstairs loft accessed by the stairs which have efficient storage underneath. The living space in the Not So Lonely Wanderer has room enough for a comfy couch, flat screen television and a large window to let in plenty of natural light. 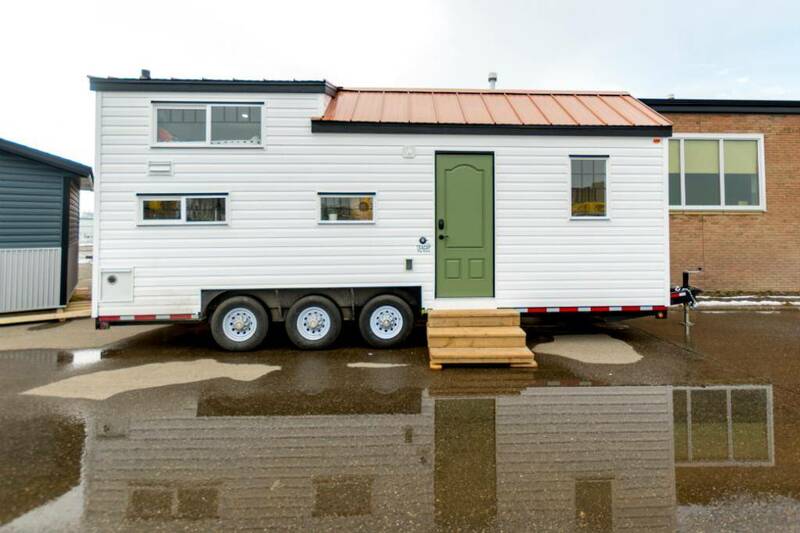 This tiny house on wheels is available from Teacup Tiny Homes in Lethbridge, Alberta. Their prices vary depending on the weight of the tiny home and the products that are installed. The Modern Cabin/Dwelling 14x20 has 280 square feet of space in a tiny design you will love. The Modern Cabin has a front covered porch and open space with plenty of windows to fill the tiny cabin space with natural light. This Modern Cabin has a separate bathroom. You'll be amazed at the efficient use of space in this tiny cabin design. You can have your bedroom off to the side with a screen or a piece of furniture to separate it from the open living space, with a kitchen and living room area that feels more spacious than its 280 square foot size. This is just one of the cabins available from Kanga Room Systems. Located in Waco, Texas they serve the Dallas and Austin areas and offer nationwide delivery. Kanga Modern Cabins are designed to be placed in the country or in locations where there will be no required inspections by a local building authority. If your cabin building site access allows, the cabin can be trucked in nearly fully assembled, which requires very little on-site time. 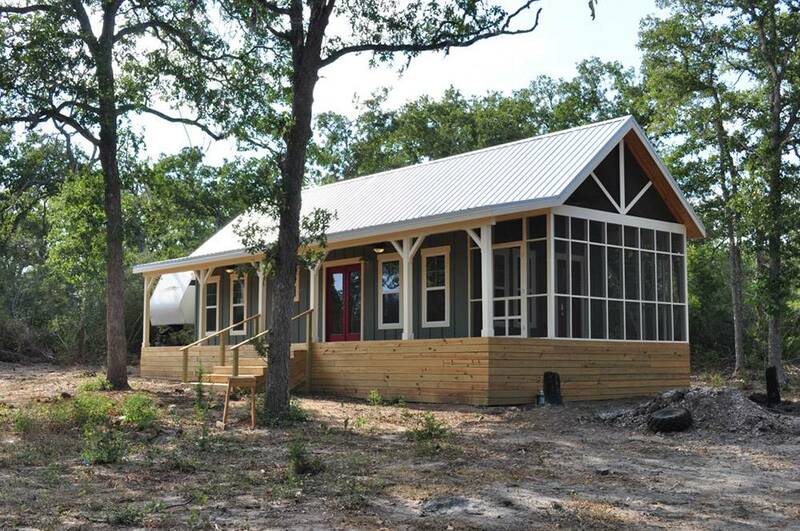 The Kanga Modern Cabins and Dwellings are available as shell kits, as installed shells (in Texas only) and turnkey (in Texas only) cabin buildings. This Kanga Modern Kwik Room is used as a home office and a music studio but could also be used as a guest room, backyard retreat, artist studio, backyard office and so much more. The modern space has French doors and clerestory windows to let in just the right amount of natural light. The Kanga Kwik Room is one of the most affordable and quickest ways to get a Kanga Room on your property. The Modern Kwik Room makes the perfect backyard office or music/artist studio and is a great solution to getting the space that you need. All Kanga kits include the pre-framed walls, panelized roof material with rafters, decking, galvalume metal roof cover, flashing, and insulation, standard pine tongue and groove ceiling cover, lap siding, house wrap, windows and doors according to your specs. Everything in the cabin kit is pre-cut and panelized, except for the siding, and is ready for a speedy onsite install. The Modern Kwik Room is just one of the cabin kits available from Kanga Roofing Systems. Located in Waco, Texas Kanga Roofing Systems serves the Austin and Dallas areas, and can also provide nationwide delivery. Kanga structures are beautifully crafted using quality building materials and craftsmanship. 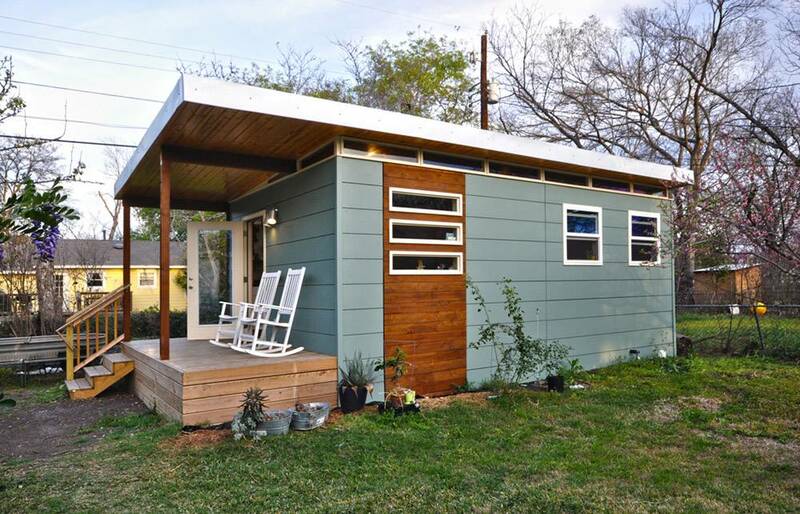 The Modern Studio Luxe 14x24 has 336 square feet of space in a tiny house design you will love. 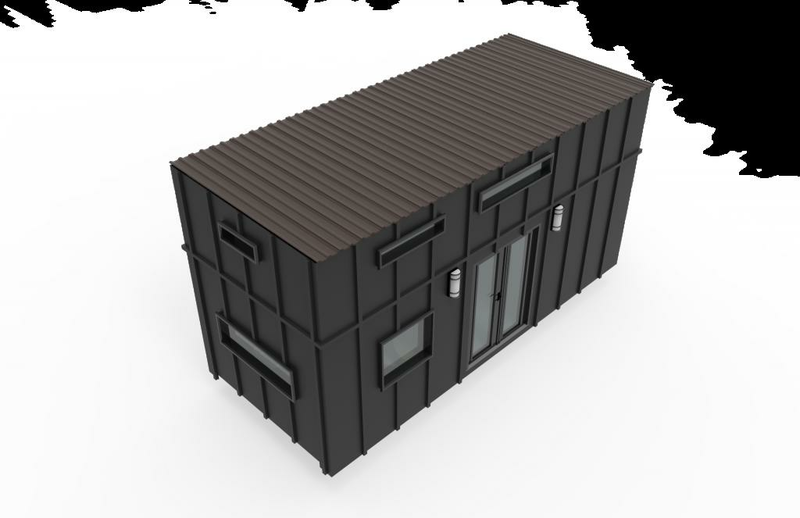 The Modern Studio Luxe is perfect for all of your small house living needs and can be used for everything from a music studio, artist studio, backyard office, guest house and so much more. A front covered patio provides a nice space to sit back, relax and enjoy the view. Inside there is wood used throughout, and plenty of windows to let in the natural light. The Modern Studio design feels much larger than its tiny footprint, with the front covered patio extending the inside space outdoors. Kanga Room Systems, located in Waco, Texas is North America’s premier designer and manufacturer of revolutionary, high quality, prefabricated wood product kits. These wood product kits can be used for stand-alone outdoor rooms and accessory structures for the home, ranch, business, and industrial sites. Kanga Room Systems feature a variety of modern cabins, studios, sheds, add-on rooms, storage rooms, children's playhouses, and playrooms available as build-it-yourself prefabricated kits or they will assemble it for you with their premium installation services. Kanga has completely revisioned outdoor rooms, with their high aesthetic, high-quality building materials and craftsmanship, for designs that look good wherever they go. The Modern Cabin/Dwelling in the city makes the perfect tiny house design for use as a guest house, accessory dwelling unit, mother in law quarters, secondary rental, or long term rental. The Modern Cabin has 336 square feet of space, perfect for all of your small house living needs. This cabin design uses wood throughout for a modern look and feel. The open space has plenty of room to have a bedroom space off to the side all within the open living space. The Modern Cabin also has the option of having a separate bathroom. This tiny house design has a front covered patio which provides a nice place to sit back and enjoy the view. This is just one of the cabin designs you will find from Kanga Room Systems. The Modern Cabin can be used for everything from a guest house, backyard office, artist studio, accessory dwelling unit and more. Kanga Room Systems located in Waco, Texas serves the Austin and Dallas areas and can ship state and nation-wide. Kanga Room Systems is a company that is committed to producing eco-conscious, energy efficient products, using sustainable building materials wherever possible. You will want to look at their wide range of rooms, cabins, sheds and dwellings available. The Cottage Cabin 16x40 with screen porch is the modern farmhouse of your dreams. This 16x40 Cottage Cabin has 640 square feet of space, the perfect set up for your dream country retreat. The Cottage Cabin has an upstairs loft, a front covered porch, screened in porch, kitchen, bathroom, bedroom and a nice sized living area with high ceilings. This beautifully crafted cabin would make the perfect weekend retreat or could be used as a guest house on your property. The Cottage Cabin 16x40 is just one of the small house designs available from Kanga Roofing Systems. Kanga Roofing Systems features a variety of cabins, studios, sheds, add-on rooms, storage, children's playhouses, and playrooms available as build-it-yourself prefabricated kits or they will assemble the kit for you with their premium installation services. The modern cabin kits are made in Waco, Texas, and the company serves the Austin and Dallas areas and can ship both state and nation-wide. Kanga Room Systems products use well-engineered components, with high-quality construction, and high aesthetic value. Whether you just need some more space or choose to live in a smaller, more efficient tiny house design, their product line encourages smart living and better small house living. The Modern Studio Luxe 14x20 will have you dreaming of a room of your own. 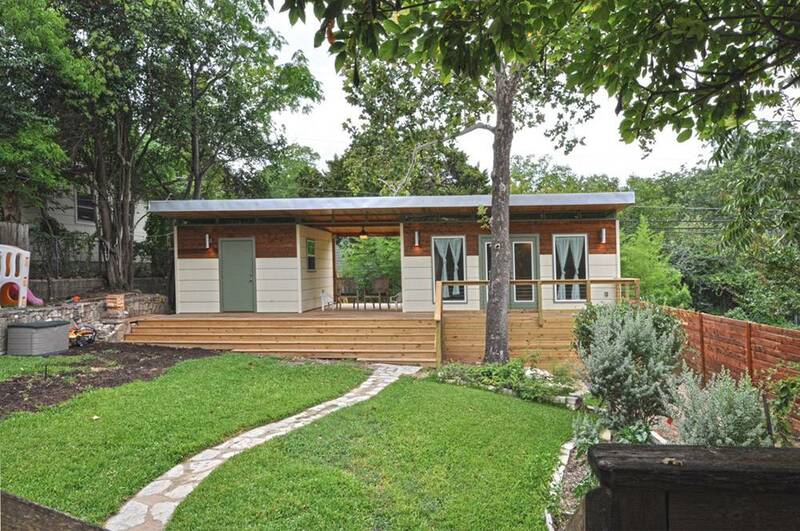 The Modern Studio Luxe has 280 square feet of space and could easily accommodate a yoga room, artist studio, guest house, pool house or backyard retreat. This Modern Studio Luxe has a bathroom, and a kitchen area to suit all of your small house living needs. The Kanga Studio Luxe is a smart alternative to site built contracting. 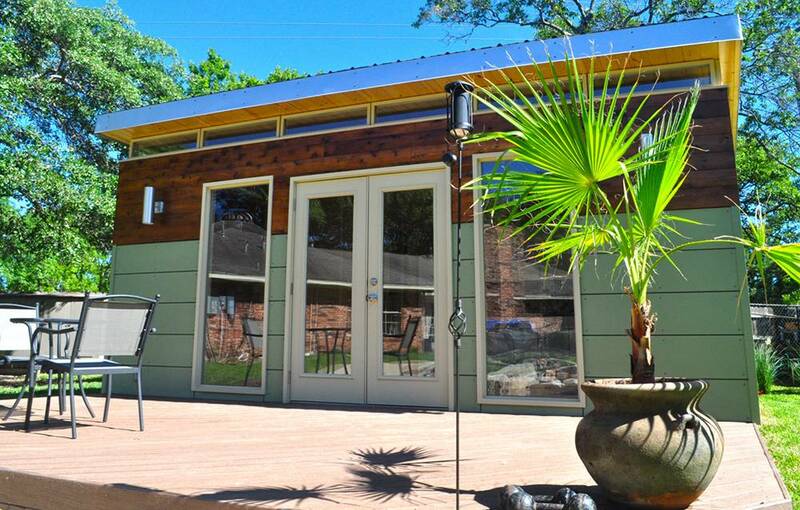 The Kanga Studio Luxe cabins are available from 192 to 500 plus square feet. And each Studio offers a bathroom option for every model; the Luxe Studio offers the signature Kanga style in packages that are beautifully finished and ready to go through the local permitting process. 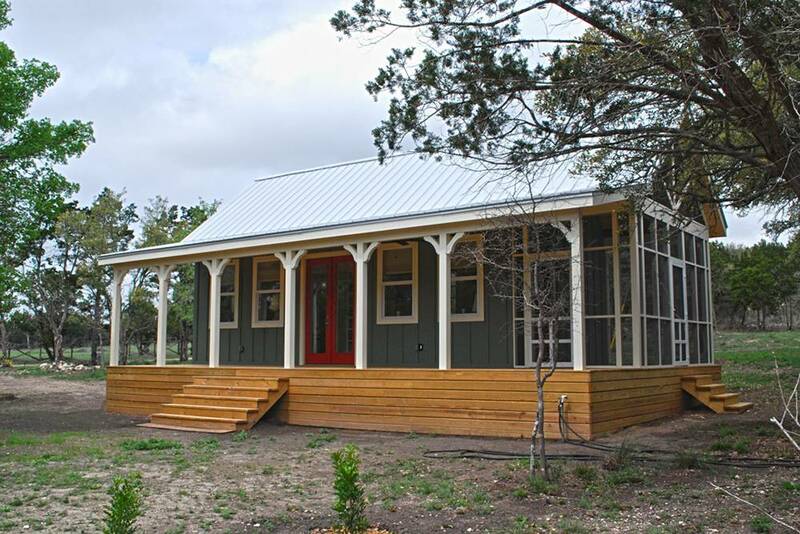 The Kanga Modern Studios are available as shell kits, installed shells (in the state of Texas only) and turnkey (Texas only) cabin buildings. Shell kits consist of the exterior building material, and the Kanga cabin or dwelling will look complete from the exterior upon local install completion with only the pine tongue and groove ceiling cover, the exposed studs and optional bathroom wall framing on the inside. Kanga Roofing Systems located in Waco, Texas is North America’s premier designer and manufacturer of revolutionary, high quality, prefabricated wood product kits for stand-alone outdoor rooms and accessory structures. These rooms can be used for home, business, ranch, and industrial sites. 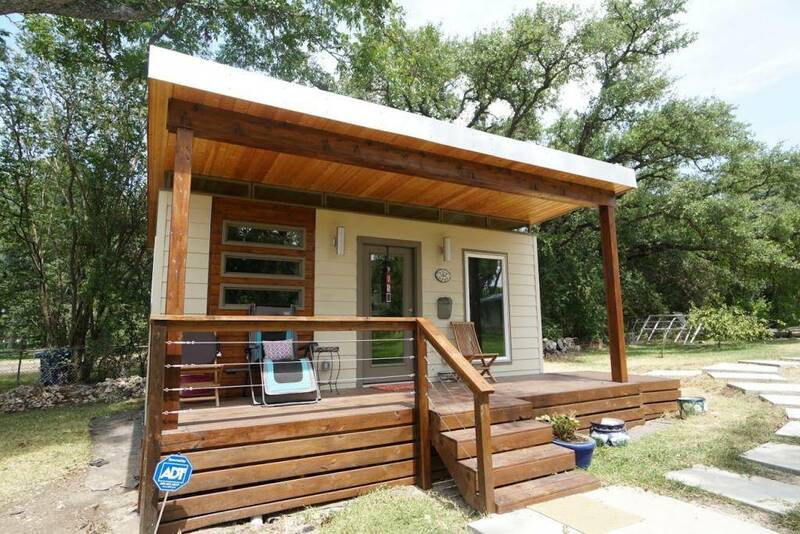 This is a Build to Suit: We have 13 wooded lots in Granbury, Texas and are gearing up to build some small luxury homes including; Texas Tiny Homes - Plan 607F is an original, one-of-a-kind design that is ideal for weekend get-a-ways, or full time residency for a single person, or a couple wanting to live the simple/good life. It's a 1 and 1/2 story Farmhouse style luxury home that has everything you need to live comfortably, as well as economically. The small luxury home has a full staircase leading up to the master bedroom loft, no crawling around on your knees with it's cathedral vaulted, beam lined ceiling. The loft could be used as an art studio or living den, and a Murphy bed could be incorporated down stairs. For more information on Plan 607F and our Granbury lots please go to our website. This small secluded home is just one of the tiny house designs available not he site. 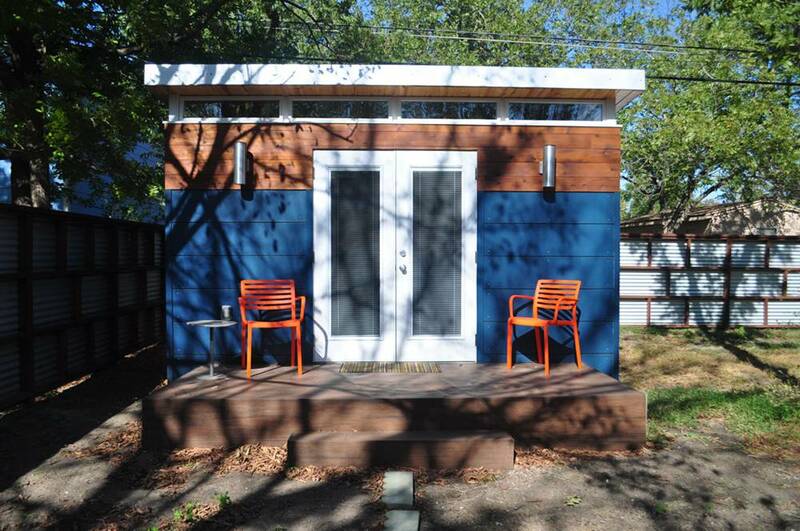 The Modern Kwik Room 12x16 is a tiny cabin design with 192 square feet of space. The Modern Kwik Room is a modern design that is perfect for all your small house living needs. You could use the Modern Kwik for everything from a backyard office, artist studio, guest house, workshop and more. The basic shell for this room comes with everything you need to build including all of the 2x4 constructions, the 2x6 rafters, pine tongue and groove ceiling cover with clear coat, the 8" Hardie Lap Siding (painted the color of choice), a 36-inch steel door with full lite glass, steel transom window frame with single pane glass, metal roof, skirting, entry steps and more. Kanga Roofing Systems located in Waco, Texas, is North America’s premier designer and manufacturer of revolutionary, high quality, prefabricated wood product kits for your stand-alone outdoor rooms and accessory structures used for home, business, ranch, and industrial sites. Kanga Roofing Systems has a variety of modern cabin designs, studios, sheds, add-on rooms, storage, and children's playhouses, and playrooms that are available as build-it-yourself prefabricated building kits or Kanga Roofing Systems can assemble the Modern Kwik Room for you with their premium installation services. 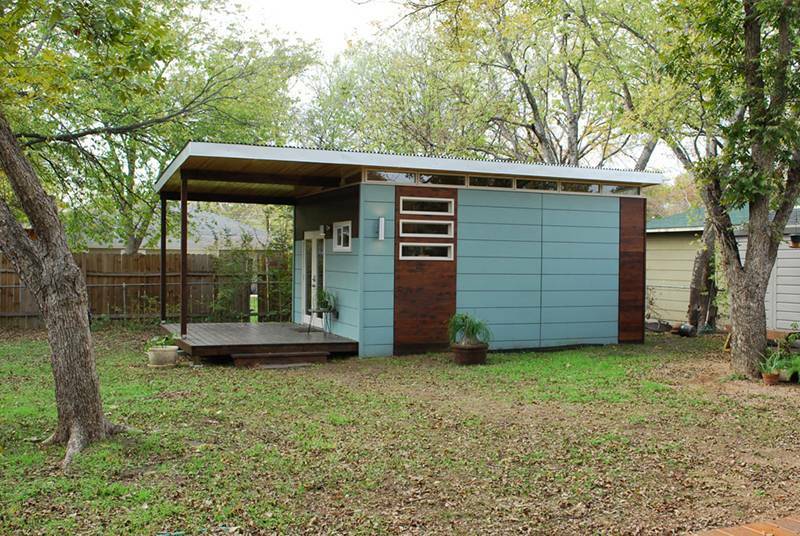 The Modern Dwell 14x20 is a good example of what you can do with a small amount of space. True to its name, the Modern Dwell has a modern look and feel and can be painted and decorated to suit your style and needs. The Modern Dwell has enough room for a bedroom space, kitchen area and living space and a separate bathroom. 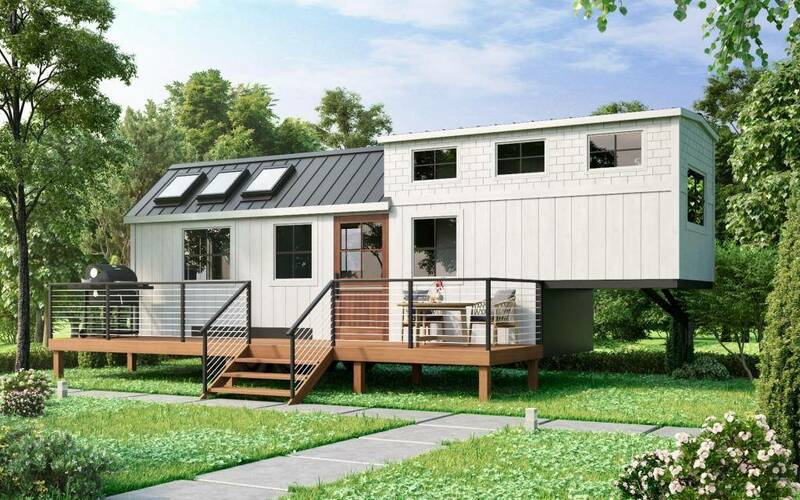 With 280 square feet of space, the Modern Dwell is perfect for all of your small house living needs. All of the Modern Dwell kits include pre-framed walls, panelized roof material, standard pine tongue and groove ceiling cover, lap siding, house wrap, optional interior wall framing (for the bathroom, bedroom, and closets), and windows and doors according to your specs. Everything in the cabin kit is pre-cut and panelized, except for the siding, and ready for a quick onsite install. Kanga Dwellings are designed for locations that will require a full on-site building inspection of the structure. These locations are generally located inside a City Limits although there are some areas in City Limits and Towns where a full on-site inspection may not be required. Currently, the floorplans for both the dwellings and the cabins are identical. You'll want to take a look inside the Cottage Cabin 16x30 with screened in porch. Kanga Cabins are designed to be placed in the country or in locations where there will be no required inspections by a local building authority. If the building site access allows, the cottage cabin can be trucked in nearly fully assembled, which will require very little on-site time. Currently the floorplans for both the Cottage Cabins and the dwellings are identical, although Kanga will be developing plans that are specifically for cabins that do not have some of the restrictive, space-wasting requirements that are sometimes demanded by city code. The Cottage Cabins and Dwellings are available as shell kits, installed shells (in Texas only) and turnkey (Texas only) buildings. The shell kits consist of the exterior building material, and the Kanga Cottage Cabin or dwelling will look complete from the exterior upon local install completion with only the pine tongue and groove ceiling cover, the exposed studs and interior wall framing on the inside. Turnkey buildings are move-in ready cottage homes that are finished on the inside and out with all of the electrical, plumbing, and fixtures. Kanga Room Systems is a company that is deeply committed to producing eco-conscious, energy efficient products, and using sustainable building materials wherever possible. The Kanga Modern Kwik Room 12x14 is Kanga Roof Systems most affordable and quickest way to get a Kanga Room onto your property. 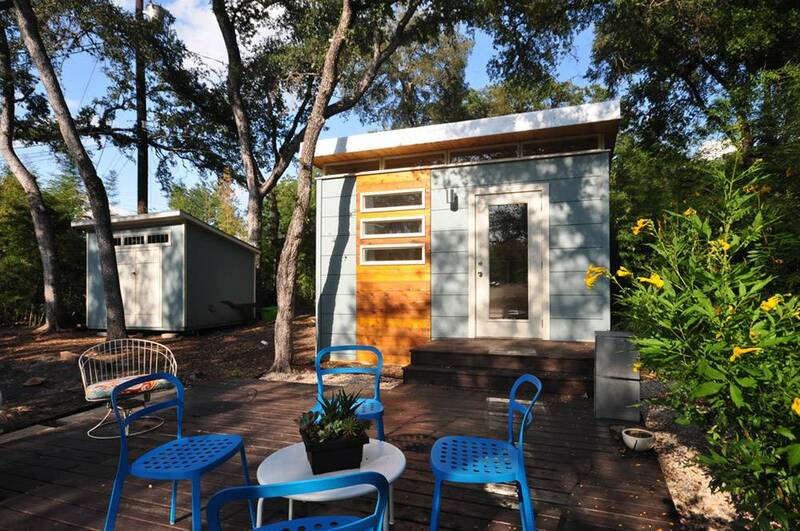 The Modern Kwik Room makes the perfect backyard office or artist studio and is a great solution to get the extra space that you want and need. Kanga Room Systems offers revolutionary modern room designs in small outdoor buildings for the changing ways that people live and work. The engineers, designers and builders design at Kanga Roof Systems are ahead of the trends, and utilize eco-conscious building materials. Kanga Roof Systems feature a variety of modern cabins, sheds, studios, storage, add-on rooms, and children's playhouses, and playrooms that are available as build-it-yourself prefabricated kits or can be assembled for you on your building site with their premium installation services. The Modern Kwik Room is just one of the modern cabin designs that is available from Kanga Roof Systems. Kanga Roof Systems is a premier designer and manufacturer of revolutionary, high quality, prefabricated wood cabin kits for use as stand-alone outdoor modern rooms and accessory structures that can be used for your home, business, ranch, and industrial sites. Kanga Roof Systems is located in Texas, United States. 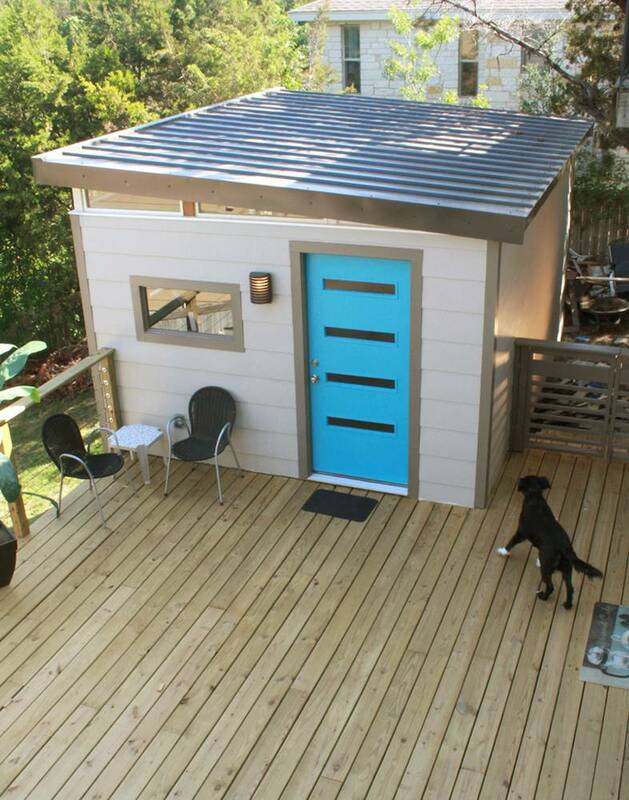 This Modern Cabin from Kanga Room Systems would be a great addition to any backyard. The company specializes in building accessory dwelling units that fit people's style and their budgets. The small spaces can be used as guest suites, rental units or even as office spaces. You can see that this Modern Cabin design was made to look just like the main home on the owner's property. With the grey siding and wood accents, it's a perfect addition to the main house. They also added a pop of colour on the door using a bright yellow to make a statement. The entrance door also has a pane of glass in it which allows more light in, and there are three simple and stylish windows off to the side of the door accented by wood. Inside the small house design, you'll see that it's set up as a studio space with no private bedroom. So this could be great for a single person to live in full time, perhaps a student or someone who is away a lot for work. There's just enough space for the bed which is nestled in the corner and looks very cozy and welcoming. There is also a great little kitchen with an apartment sized fridge and a built-in burner for cooking. Close to the kitchen is the bathroom which features a shower, sink and toilet. There also seems to be a storage closet too which is always handy. What a great small space overall, and such great use of the 224 square feet. When building a tiny house on a foundation, there is so much more freedom to get creative with the home design and floor plan. Since there aren't really any restrictions on the height, length and width of a tiny house on a foundation, the options are limitless. The Modern Studio Luxe showcases this nicely. This unique tiny house design features a central space and a shed that are connected by a breezeway. The main area of the tiny house design holds a sofa, an office space and a bathroom. So most likely this space is used primarily as an office. It could also be used as a guest house or a rental unit if there was a bed or a convertible sofa in there. There isn't a kitchen either, but the bathroom is a full 4 piece bathroom including a bathtub, vanity, sink and a toilet. So it would be a great place to work all day. The other half if the tiny house design is a storage shed, but that could comfortably hold a kitchen space or even a separate bedroom area that's private from the rest of the house. These small home designs make great additions to a regular home, but they can also be used as full-time homes too for those who don't require a lot of space. Or, for those who would like to start small and build their dream house over time. 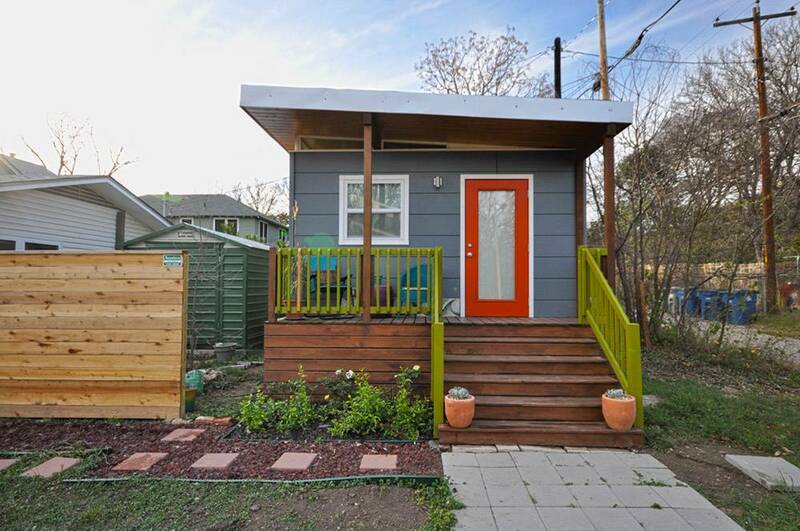 The compact size of these accessory dwelling units not only makes them very affordable for the initial build but also very affordable and efficient to maintain.